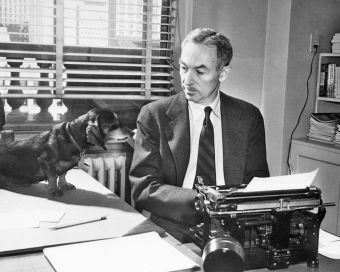 Today is the birthday of EB White (July 11, 1899 – October 1, 1985), reminds the Writer’s Almanac. Earlier this month, I posted an entry quoting the writer William Zinsser’s homage to White in his book, On Writing Well. The Elements of Style by William Strunk Jr and EB White remains a classic English language style guide. I was looking at my paperback copy – the third edition of the book – which has only 92 pages. A little book but so big in authority and influence. When I start to write, my mind is apt to race, like a clock from which the pendulum has been removed. I simply can’t keep up, with pen or typewriter, and this causes me to break apart. I think there are writers whose thoughts flow in a smooth and orderly fashion, and they can transcribe them on paper without undue emotion or without getting too far behind. I envy them. When you consider that there are a thousand ways to express even the simplest idea, it is no wonder writers are under a great strain. Writers care greatly how a thing is said—it makes all the difference. So they are constantly faced with too many choices and must make too many decisions. That is the beauty of language and a challenge for the writer. Any idea, person, object or incident can be described in so many ways – the writer needs judgment and skill to do it clearly, succinctly or memorably.